So this is my first candle! I had some set backs but I did it! Since it is almost Valentines Day I wanted to stick to that romantic theme. When I think of Valentines Day and romance I think of roses and candles, so why not put them together! I imagined adding rose petals to a candle will give it a nice pop of color with the white wax, and I am very pleased at the way it ended up looking. First thing is to heat up your hot glue gun, and judging on the size of your jar chose how many wicks you would like. (I regret using only two, I wish I used three.) Hot glue your wicks into your jar so they stay secure. Next take the straws and add slits in them or sticks to secure the wick in place. Measure your wax and put in double boiler, or make one like I did. Start melting wax, I used a chopstick to stir it to evenly distribute the heat. Heat wax to 170 degrees F and add essential oils. Add a few drops first and add according to how scented you want it. I then turned down the heat so it would start cooling, and add rose petals to the wax. Once rose petals are fully coated, I took a paint brush and fished them out one by one and "painted" it to the wall of the jar. Your rose petals should stick as the wax cools. 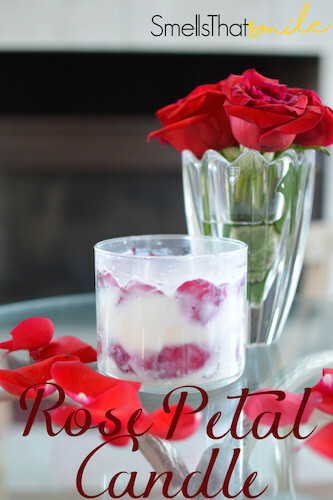 Let the jar sit for a little to let the rose petals cool and stick to the wall of the jar. As the jar is cooling, remove wax from heat and let it start to cool as well. Slowly add your wax to your jar, fix anything that has been moved. Then let it cool, I put mine in my refrigerator.